Fill in your details below and we will let you know within 24 hours if we can get Chrono Bomb: Night Vision to you with haste! 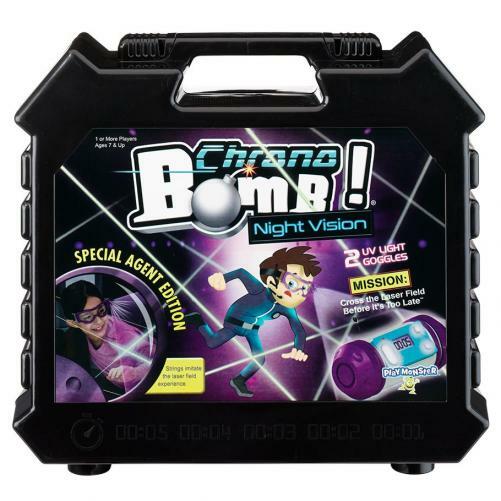 Chrono Bomb® Night Vision is a super secret spy mission where kids use the included clamps and long, 37-ft. string to create a “laser” field to crawl through. At the end of the maze is the bomb, counting down…tick, tick, tick! So, you have to hurry, carefully, and make it to the end to defuse the bomb and be the hero! Play over and over again, building new courses each time or trying to beat your or your friend’s time! Plus, turn the lights out and play in the dark using the UV light goggles to light up the string!